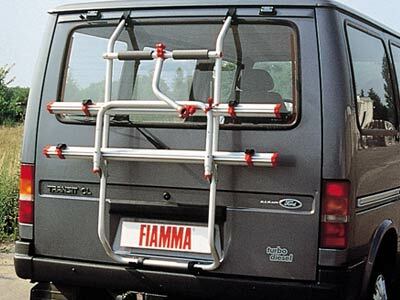 The Fiamma Carry-Bike Ford Transit is suitable for all tailgate vans built after year 2000 upto 2014. No drilling necessary thanks to the tailor made, easy installation brackets supplied. Supplied as standard with: 2x Rail Quick (bike support), Bike-Block Pro 1 and 3 (frame to bike holder), 2x Rack Holders (secures the bike support when folded away) and Security Strip (buckled strap). Supplied as standard to carry 2-bikes but can also be purchased with an additional Rail Quick support and Bike Block to carry 3-bikes (see images above). 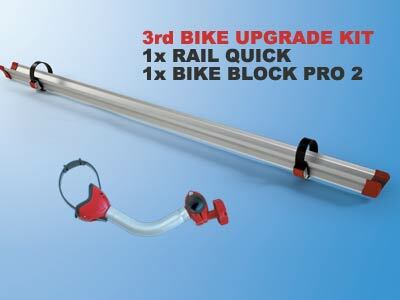 3rd bike upgrade kit: 1x Rail Quick and 1x Bike Block Pro 2.